Canadian Mint building in Winnipeg, Manitoba. This high-tech state of the art facility which occupies 14,864 square metres, produces every single Canadian coin in circulation in Canada. It also produces coins for numerous other countries. Built during the 1970's, the triangular rose coloured glass building was designed by architect Etienne Gaboury and was opened in 1976. 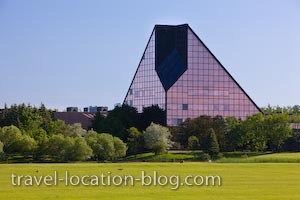 Rose coloured glass exterior of the Royal Canadian Mint Building, City of Winnipeg, Manitoba, Canada.